Assuming that crude oil prices strengthen over the next decade, certain cracker operators in Europe may again consider an increase in natural gas liquids (NGL) cracking and plan investments to retrofit existing facilities for this purpose. There will be consequences in the supply of cracker by-product streams, which are important to many downstream industries. More recent cracker developments have already led to the tightening of supply of intermediate C4 streams like raffinate-1 and raffinate-2. Future cracker developments could create an even greater impact on merchant by-product stream consumers. IHS Markit forecasts that by end of 2018, Western Europe will produce around 20.0 million metric tons of ethylene. Over the short term, production will grow at around 0.3x average GDP. However, it is important to note the impact of changes in cracker feedslate over this period and beyond. As crude oil prices strengthen over the next decade, there is likely to be a move toward cracking lighter feedstocks. Ineos at its Grangemouth facility in the UK already consumes imported ethane from the US, sourced from shale gas. Borealis has also invested in ethane logistics at its Stenungsund cracker and is currently modernizing its furnaces. Converting NGL crackers for enhanced ethane use is more straightforward than the original intentions of Versalis, which sought to retrofit its Dunkirk facility in France from naphtha to at least partial ethane use. This project is reportedly on hold. While a wholesale retrofit of regional cracker capacity is unlikely, there are a number of operators looking to increase their flexibility to use price-competitive, shale-derived NGLs sourced from the US. A number of candidates enjoy coastal locations, which provide ease of logistics (see Figure 1). Even crackers in the Mediterranean could move to lighter feedstocks. Within 10 years, naphtha will make up 54% of Western European cracker feedstock supply, down from as high as 73% in 2010. Changing feedslate impacts the distribution and volume of co-products. The greatest impact of moving to lighter feedstocks is found in the heavier by-product components of the cracker. 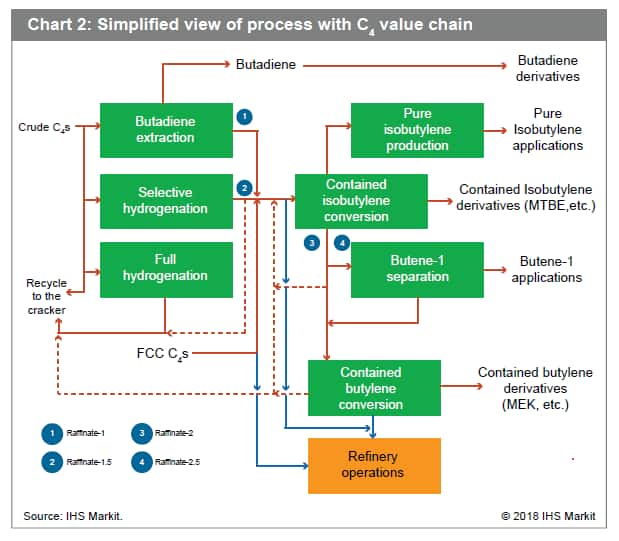 Recently our Chemicals Consulting team within IHS Markit has aided companies who consume some of these heavier components and various resulting intermediate streams. There is grave concern, especially among merchant consumers, for future availability. These companies have approached IHS Markit for help in solving potential future supply problems. Management of the C4 chain is complex, given that a strategy is needed to valorize each component. A naphtha cracker will generate around 0.338 metric tons of crude C4 stream per ton of ethylene made. The yield of C4 stream reduces significantly when moving to lighter feedstocks; in addition, the process results in composition changes. 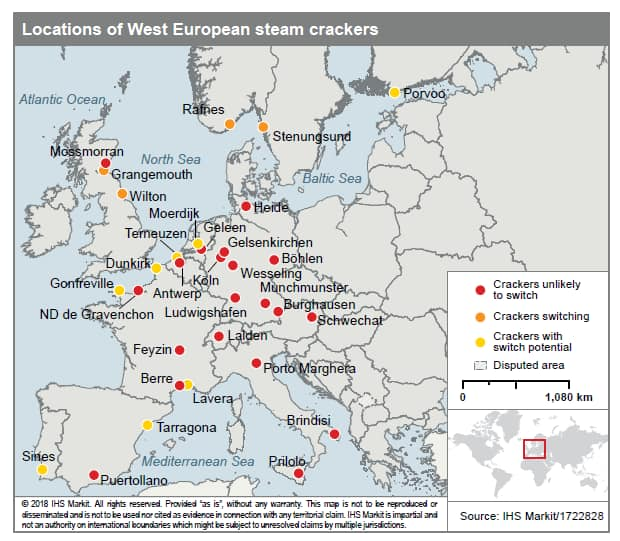 This year, Western European steam crackers could generate around 2.3 million metric tons of contained butadiene. IHS Markit forecasts that around 90% of this will be extracted to serve the synthetic rubbers industry, the polyamide value chain, and other markets. There are other ways to process crude C4s. In the early 1990s, selective and full hydrogenation technologies were introduced on certain cracker sites to process contained butadiene. Previously butadiene could be extracted, or crude C4s recycle could be co-cracked or even fueled. Hydrogenating contained butadiene provided mainly butylenes for downstream chemical conversion (see Figure 2). The contained isobutylene remains virtually unchanged. The increased volume of butylenes served applications like butene-1, MEK, and higher oxo alcohols. Butylenes also help in refinery processes like alkylation to boost octane in gasoline. In 2011, flexible cracker operations in the US moved to much light shale-derived NGLs, thanks to their competitive price. This shift in turn severely reduced the availability of domestic Crude C4s and contained butadiene. In Europe, cracker operators such as BASF and OMV – that possessed an existing selective hydrogenation infrastructure – constructed butadiene units. Evonik, a company which “collects” C4 streams of various forms, also invested in new butadiene capacity in Antwerp. These developments have caused a considerable upheaval in C4 market dynamics, reducing the availability of selected butylene streams for chemical conversion. A number of consumers of butylenes have had to develop new strategies for feedstock supply or adapt their operations. Putting butadiene aside, the refinery FCC unit does generate a C4 stream that can serve the production of octane boosters such as MTBE, alkylate, and polygasoline. Companies like ExxonMobil, which have developed extensive refinery-petrochemical integration, will also use such streams in chemicals production. Looking forward, however, there is concern that the move to lighter feedstocks by certain crackers will create a secondary effect on C4 supply. In the case of butadiene alone, Europe will need to recovery 96% of available butadiene from cracker operations to meet demand and supply export markets. There will likely be an ongoing impact on merchant consumers of isobutylene and butylene-containing streams for applications like polyisobutylene and MEK. Some consumers are already looking to source the streams needed from outside the region. Can Technology Provide a Solution? Over the last few years, technology played a role in supporting C4 stream availability. In the early 1990s, crude C4 selective hydrogenation helped manage the situation. Other C4 management technologies like BUTENEX® from Krupp-Uhde and C4 OLEX® from UOP were also commercialized. The 2010-2012 “shale-gale” encouraged the revisit of deep and oxidative hydrogenation processes to supply butadiene. Today technologies such as C4 skeletal isomerisation, also developed in the 1980s and 1990s, may need to be revisited to provide more isobutylene in Europe. While the refinery can provide a source of isobutylene and butylenes, their content falls far below that of cracker-sourced materials. Certain applications can be very sensitive to C4 composition, such as polyisobutylene. However, innovations in Argentina allow isobutane dehydrogenation on the small scale, providing an isobutylene concentrate for polyisobutylene production. Technology solutions are possible with alternative feedstocks. However, there is clearly a need for considerable investment to make this happen. With a strengthening crude oil price, IHS Markit believes that the regional cracker feedslate in Western Europe will likely move lighter. The impact of this change will be keenly felt in value chains like C4s and more specialized cracker by-product streams. Merchant consumers of isobutylene and butylene streams may face considerable supply challenges. They may need to look outside of the region for new supply sources. However, investment in certain technology solutions could help alleviate supply. Consumers of more esoteric cracker by-products will also find local supply challenges emerging and continue to rely on deep-sea or out-of-region supplies of C5 and C9 components.